Writing from my home in the Greater Toronto Area of Canada and sending a warm welcome to this new blog! 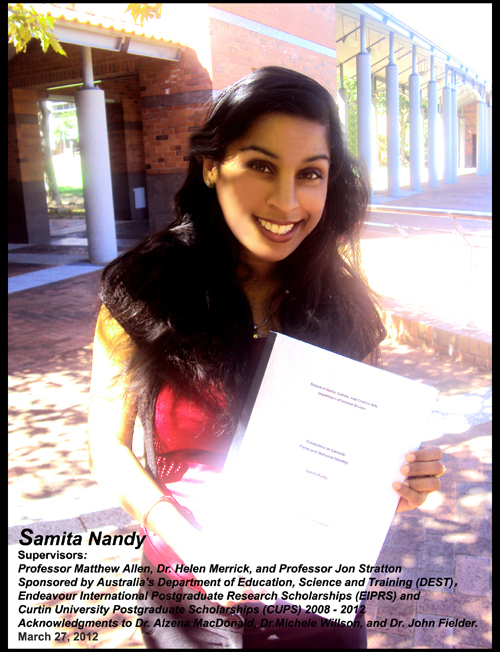 It has been 8 weeks since I submitted my PhD dissertation at Curtin University in Australia. My research and practice examine construction of celebrities within social discourses, cultural meanings of fame, and how stardom is shifted and articulated through various cultural sites. These sites include film festivals, award ceremonies, gala film premieres, entertainment magazines, reality TV shows, and the Internet among many others. As a Celebrity Cultural Critic, I offer critical insights, commentaries, and strategic and inspirational guidance in relation to fame, notions of popularity, and talent in media. These insights are based on my dissertation as presented below. For the dissertation, I extend my gratitude to Professors John O’Neill, Anthony Wensley, Bill Thompson, Louis Massey, and Samaresh Nandy among many more individuals and institutions. This blog is an academic and artistic expression that aims to extend cultural understandings and observations of fame within social and personal settings. It will speak to both celebrities and fans who are engaged with notions of popularity and art in everyday life. I welcome all public personalities, artists, and creative readers to connect through this blog. You are on a creative journey of life and I believe that you, as many others, can shine higher on your own path. As E.E. Cummings once said, “To be nobody but yourself in a world that’s doing its best to make you somebody else, is to fight the hardest battle you are ever going to fight. Never stop fighting.” The blog aims to empower all in shining as a unique star! Feel free to join the mailing list for forthcoming posts. Have a wonderful day week ahead and looking forward to staying in touch! Congratulations for this new blog! The introductory post itself has aroused lot of interest. This is definitely going to be useful to its followers. Thank you for inviting me here. All the best!